§ 211.6 Methods of affixation and placement of mask work notice. C.C.,W.D.Wash.N.D. (10-18-1909) ¤ 173 F. 419. The cover of an issue of Pacific Fisherman bore the title “Pacific Fisherman annual” although an inner page gave the correct title. This page, pg. 19, was among the cut pages submitted for deposit. Page 19 was also the first page of “ordinary reading matter” after nothing but ads. Copyright notice was on pg. 51, which the defendant did not examine. The suit failed. United Thrift Plan, Inc., vs National Thrift Plan, Inc.
D.C.,E.D.N.Y. (8-14-1929) ¤ 34 F.2d 300. “It is thus apparent that notice was not given by the plaintiff in the manner prescribed by the statute.” The Court considered omission remedies, but too many copies were issued and no effort had been made to correct them. C.C.A.Va. (6-10-1941) ¤ 120 F.2d 537. Penarts Advertising copyrighted “Advertising Manual for Loan Advertising, series of Newspaper Advertisements, volume A” on October 22, 1931. This was a book. Bradley Advertising Company, Inc. became owner of the work and on December 19, 1938, merged with Deward & Rich. On March 14, 1937, Bristol Savings contracted to use the ads. After the one-year contract ended, Bristol continued using the ads, insisting that it could do so without a license because the ads were not under copyright. The Court found that there were no notices on the individual leaves in the “book,” and as these leaves were separately published, the work had been dedication to public. C.A. Iowa (10-17-1950) ¤ 184 F.2d 470. The title page of the disputed work had on it, “1948-49 Kossuth County TAM Service”. There was no notice on that page nor on page immediately following. However, page 3 has on it, “Copyright 1948, R.C. Booth Enterprises, Harlan, Iowa.” The plaintiff said on behalf of his work that page 3 is the title page. The Court affirmed. Friedman vs Grolier Enterprises, Inc.
Tom Dunnahoo’s company Thunderbird Films sold its reproductions of films believed to be in the public domain. Buyers would order 16mm and Super 8 reproductions. Dunnahoo was already under a Judgment Pursuant to Stipulation which enjoined him from copyright infringements beyond those he committed up to 1972, so his conviction in this case (which involved three films) resulted in his having to pay damages of $40,000 to the studios with which he entered his decree. 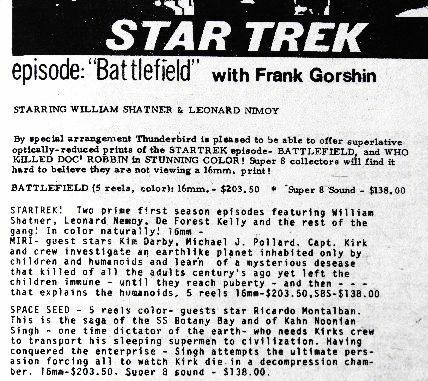 illustration: listing in a Thunderbird catalog for Let That Be Your Last Battlefield and two other Star Trek episodes. Paramount Pictures Corp. vs John and Dorothy Hampton (launch this) had defendants believing that they could show their own copy of a Paramount movie in a theater without Paramount’s permission, even though a copyright notice was on the film leader. “The law does not specify where a notice should be placed on a motion picture film, but the Office will recommend that the notice appear on or near the title frame. “Registration will be made if the notice appears either in the opening frames containing the title and credits or at the end of the film. “(iv) At or immediately preceding the end of the work. “(2) In the case of an untitled motion picture or other audiovisual work whose duration is sixty seconds or less, in addition to any of the locations listed in paragraph (h)(1) of this section, a notice that is embodied in the copies by a photomechanical or electronic process, in such a position that it ordinarily would appear to the projectionist or broadcaster when preparing the work for performance, is acceptable if it is located on the leader of the film or tape immediately preceding the beginning of the work. United Dictionary Co. vs G & C Merriam Co.
G & C Merriam Co. (of Massachusetts) created, published and copyrighted Webster’s High School Dictionary, a book. Copyrights were taken out in England and the U.S. at the same time. The U.S. edition contained “statutory notice of copyright” but the edition sold in England (retitled by the English publisher as Webster’s Brief International Dictionary) omitted notice of the American copyright. United Dictionary (of Illinois) obtained “the English book with the intent to reprint it, and was about to publish it when restrained.” The Supreme Court examined: “The question is whether the omission of notice of the American copyright from the English publication, with the assent of [Merriam], destroyed its rights; or, in other words, whether the requirement of the [copyright] act … that notice shall be inserted ‘in the several copies of every edition published,’ extends to publications abroad.” The Court answered, “we are satisfied that the statute does not require notice of the American copyright on books published abroad and sold only for use there”. P. Kaufman, Inc. vs Rex Curtain Corp., et al (launch this) involved copyright notice on a sticker atop fabric.